​Everyone’s seen the new Hexacopter craze on the net. The videos make flying look so easy. But learning how to fly many of the pro-level quads such as the Parrot Bebop can be difficult. Do you really want to invest that much money only to have your hexacopter go flying off into the sunset? Fortunately, toy developers such as JJRC have designed hexacopters with the beginner in mind. 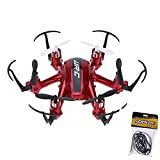 Their latest is the JJRC H20 Hexacopter Drone six axis, four channel, gyro nano drone. Beginner quad pilots want more than a mini toy to fly in the air, they want a cool looking drone that not only looks like you spent a lot of money, but that is easy to learn to fly too. The JJRC H20 is equipped with some great features; from the quad, to the motor and battery system, the remote controller, and its flying capabilities. The JJRC H20 was developed by JJRC and made specifically for the beginner. It has a built-in six axis gyroscope, and uses 2.4 G remote control technology. You can do some great tricks with the 3D rolling capability. The JJRC H20 is a bit smaller than your average quad, but it does not look like a child’s toy. The controls are intuitive and the JJRC H20 will actually hold position in the palm of your hand. It takes on the appearance of a hummingbird, as the bird bats it’s wings so rapidly you can barely discern their individual details. You’ll see the blades spinning so quickly, that you won’t be able to spot them either. The JJRC H20 has a variety of speed controls, so you can start out slow, and work your way up to pro level. 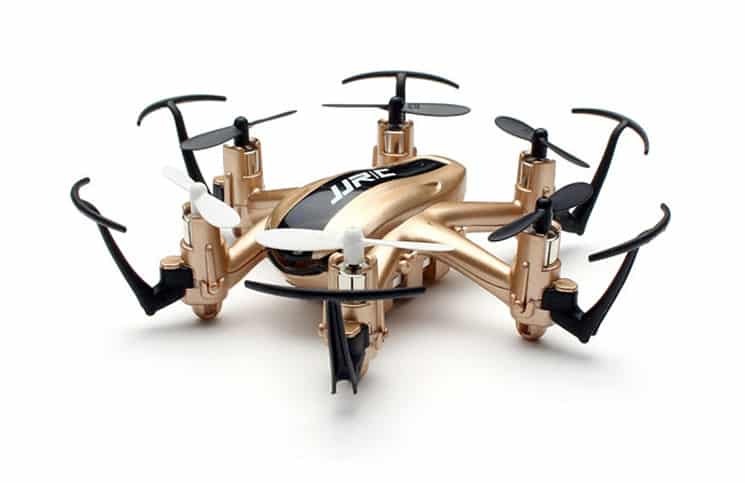 The JJRC H20 comes in two cool color choices: gold and black; and red and black. There are many other cool features of the JJRC H20 that beginners will be excited to try during their first flight out. The JJRC H20 hexacopter does not come with a photography or video camera, nor can one be easily attached. But the JJRC H20 is great for learning how to fly. Should you decide to venture into aerial photography or video production, you can consider one of the higher end models in the JJRC line. The JJRC H20 is designed to be easy to fly, so that even the beginner can quickly get the drone in the air, and attempt flying and doing tricks on their first day out. There are some cool features of the JJRC H20 that make it one of the best choices for the beginner. The four channel system enables you to choose which one you need in order to eliminate interference from other on the JJRC H20 quads on the flying field. A six axis gyroscope is built into the JJRC H20. It has an imported card. This gyroscope is used to detect changes in the positioning of the hexacopter. As it flies through the air it can sense when there is a change in direction. It can detect its positioning in the air. This is one hexacopter that you can achieve take off by simply tossing it in the air, and it won’t fall to the ground. It’ll be able to stabilize itself, and take off flying. The gyroscope won’t be confused with its location. 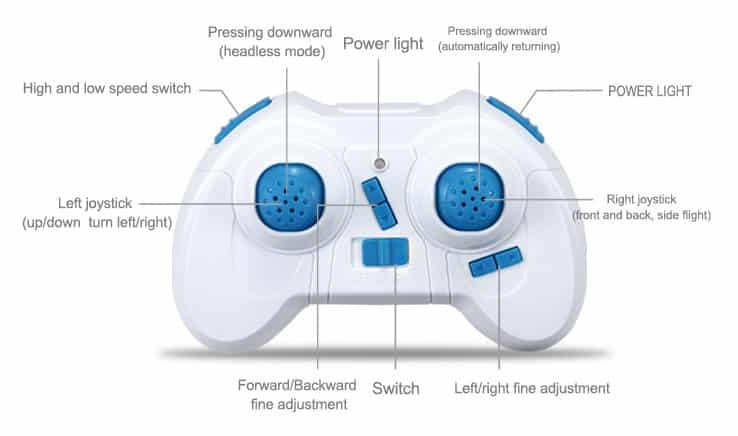 The JJRC H20 has a separate 2.4GHZ remote controller that is in a white and blue plastic casing finish. 2.4GHZ makes for more accurate controlling while your drone is in the air. You’ll find that you can send your it out to farther distances than any other compact quad, and that it responds immediately to your minute adjustments. The RC system is a simplified version of other quadcopters manufacturer’s RC systems, but it was designed this way to allow for a quicker understanding of how to make it work, and control the moves of your hexacopter while in the air. The remote controller takes a set of three triple A (AAA) batteries of 1.5 Volts. They are not included in the box, so you’ll want to ensure you have some on hand before your order arrives. The hexacopter itself is rechargeable with the included USB cord. There are many fun controls on the controller, despite it being a compact version of the higher end hexacopter models. To the top right of the controller is a power light indicator to let you know that the controller is on and ready to go. There is also a small power light on the top middle of the device. There are two short blue joysticks: left joystick, and right joystick. To make your JJRC H20 turn left or right you move your joystick up or down. To make your hexacopter do sideways flight, move your right joystick front or back. A blue switch can be pushed left or right to turn your controller on. Right above this is another switch that enables you to finely tune the forwards and backwards motion of the drone. Underneath the right joystick is a switch to finely tune the left and right motions of the quad. Headless model enables you to fly your drone in the direction you are controlling its moves, despite it not being oriented forwards. To achieve headless mode you press the right joystick downwards. To get your drone to automatically return to starting position, you’ll press the right joystick downwards. Headless mode is beneficial when you’re having difficulty seeing where the front of the quad is, particularly if you’re flying it out to 100 meters. If you wish to control the speed of your drone, you can flick the high and low speed switch on the top left side of the radio controller unit. The CF mode makes it easy to change the direction of your drone in the air. Simply operate the remote control to quickly and easily adjust the flight direction of your drone. Did you know there is still a front side even on a quad? It’s much like how there is a front window on a helicopter, so the pilot can see out. Well, there is actually a front orientation to your quad too, even though your are flying the drone by remote. The LED running lights light up in red and blue. This enables you to keep the quad in a forward position through the air. You can avoid having to switch to headless mode if you can easily see which way the front of your drone is pointing. The LED lights also light up your drone at night, making flying a funner experience. The 360 degree roll over function enables you to perform cool rolling maneuvers in the air. Even a beginner can do it. All they have to do is press the button. You’ll be able to impress your friends, even when you’re just gone out for your first flight. The JJRC H20 has been built with durability in mind, as well as the protection of your home should you decide to fly it indoors. It has plastic fan blades that are made from flexible materials so that they don’t break easily if they hit something. The blades will bend and bounce back. The JJRC H20 has a built-in internal motor that is completely enclosed, to protect it from impacts and collisions. It’s covered with a layer of high-quality ABS plastic. This keeps the motor from overheating, as well as providing an additional layer of resistance to impacts. JJRC, or JJR/C Toys Co., Ltd. is located in China, and is a popular Chinese manufacturer of toys for kids and adults. They keep their pricing affordable and fair, with a fun range of easy-to-operate toys. They’re located in Nei Long industrial area, Wai Sha town, Longhu District, Shantou City, Guangdong Province. 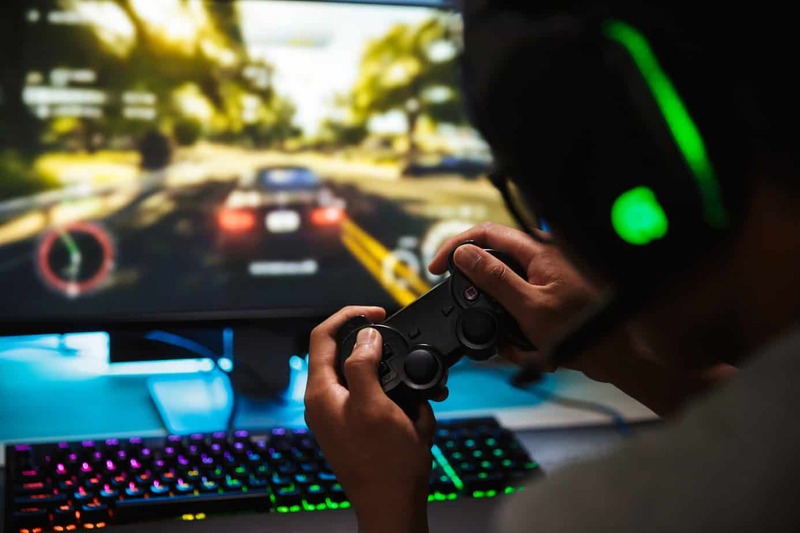 They’ve focussed on mostly high-tech toys such as robots, toy guns, and remote-controlled vehicles such as quadcopters and drones. They have an extensive collection of remote-controlled toys, and are releasing new models every year, to keep up with the demand for these types of toys. They sell beginners and professionals remote-controlled aircraft, three to six channel drones, high speed remote-controlled toy cars, and remote controlled tanks. 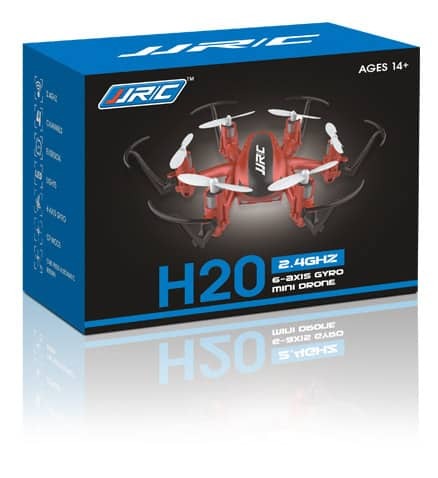 JJRC supports your JJRC H20 with a variety of help on their website. You can contact them through the easy contact form. You can send them an email, or give them a call, though they don’t offer a toll free number at this point. You can subscribe to an email list to hear about the latest JJRC toy releases. You can watch video of your chosen product, to see how it looks while in operation. 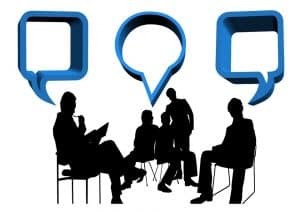 If you’re looking for support, you can select your main category, such as Primary R/C Aircraft, and find a list of FAQs to help you out. The Search box may also help you to find what you need on the website. The JJRC H20 is made by JJR/C Toy company. It comes in two cool color choices of gold and red. It’s a six-axis remotely-controlled aircraft that measures 10.5 centimeters wide by 10.2 centimetres wide by 2.5 centimetres tall. It’s built with LED running lights. Its configured frequency is 2.4GhZ, and has four channels. The JJRC H20 is made with ABS plastic materials. It has a six-axis gyroscope. The JJRC H20 can be flown both indoors and outdoors. It has a remote control distance of over one hundred meters. It’s fully rechargeable and has a battery capacity of 3.7 Volts 150 mAh. The JJRC H20 has a charging time of forty-five minutes. There is an included USB cord for wall outlet recharging. It’s suitable for people who are fourteen years of age and up. 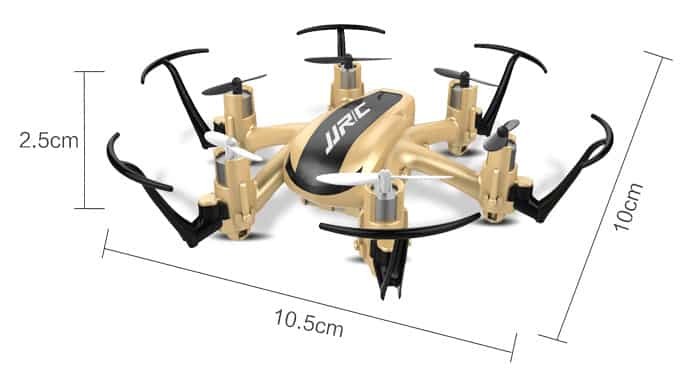 Ensure your JJRC H20 drone comes in a rectangular blue box, with a picture of the red or gold quad on the front of the box, the company JJRC logo, ages 14+ at the top right, and the lettering: H20 2.4Ghz 6-axis gyro mini drone at the bottom of the box, in order to avoid buying product clones. In the cardboard box you’ll receive one JJRC H20 four channel, 6 axis drone, a white and blue plastic remote controller, six replacement blades, a battery, a USB cord for charging, a screwdriver, and an operations manual. If you’ve been searching for the perfect drone that not only looks cool, but is easy to fly, the JJRC H20 may be what you’ve been seeking. Its affordable pricing places it within reach of any beginning quad pilot. You can fly with confidence, knowing that it won’t be easy to damage on the field, nor will it damage your possessions should you choose to fly it indoors. You’ll be impressed with the many functions on the JJRC H20. The handy return to home function will avoid loss while outdoors. It comes with some cool trick maneuvers that will impress your friends with those fancier models of quads. And best of all, the JJRC H20 still looks like a professional quad pilot’s model, rather than a toy. Your friends will think you spent three times as much cash on the JJRC H20 hexacopter, than you really did!